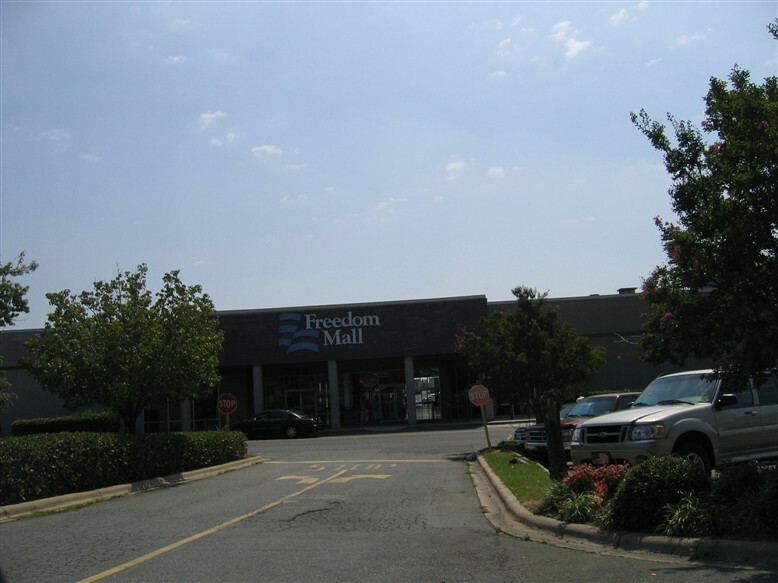 Freedom Mall, located on the west side of Charlotte, opened in 1964 as a 330,000 square foot anchor to the westside retail scene. It is, to this day, the only mall on the west side as far as I know. The prime shopping areas in Charlotte are south and more recently north with the opening of Northlake Mall in September 2005. There are also the ever-popular (much to our chagrin) victims of new urbanism known as lifestyle centers, and they’re popping up everywhere. Freedom Mall has seen better days; however, it still functions as a community center for the surrounding, largely African-American community. Flu shots and other community resources are regularly available at the mall throughout the year. In addition, families from great distances have been known to travel to the mall for the region’s only African-American Santa Claus at Christmastime. 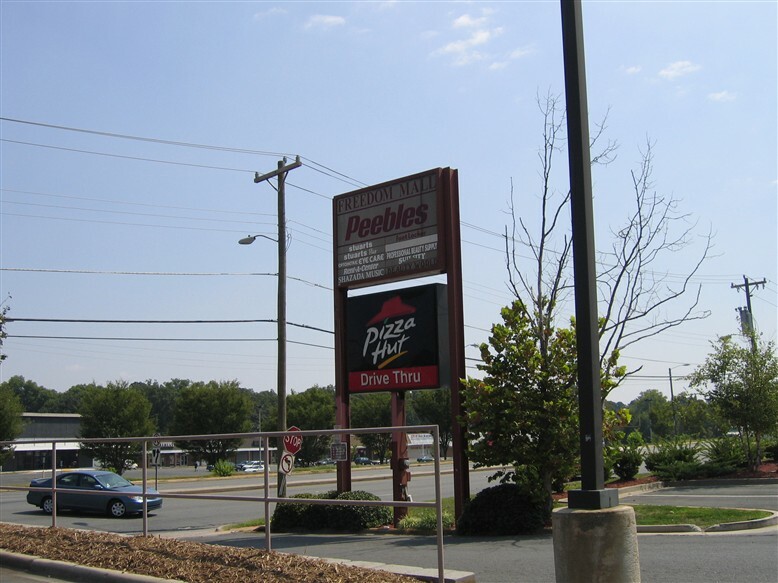 Freedom Mall’s lone anchor is discounter Peebles, a chain based in the mid-south and spread throughout Dixie. Other stores include Stuarts, a Rent-a-Center, Foot Locker, and several beauty supply stores. There are also local stores selling urban wear, music, and toys. The mallway’s design is a basic barbell between the Peebles and what I’m told was a grocery store, but is now offices. Aesthetically, Freedom Mall’s decor is extremely dated yet simplistic. There aren’t many wooden tones or facades typical of the era from which Freedom Mall came to us in its time machine; however, the marbled cream-colored floor is a gem as well as the ancient Peebles sign above the main hallway. I took these pictures of Freedom Mall in August 2005. As always, comments, anecdotes, and more information about the mall to complete its story are much appreciated. The new northside mall is Northlake… things are booming up there. Man…I remember this mall from my childhood, my family is from the west side of Charlotte and most still live there. When my grandmother was alive, I remember taking big family trips to Freedom Mall. I vaguely remember the Target, it closed sometime in the early 90’s. The noticeable Target “red stripe” on the side of the building is still there, I think…I pass by it every now and again but haven’t really paid much attention, and definitely haven’t been in there in definitely 10, probably closer to 15 years. I had no idea there was a Foot Locker and such inside, I had always classified it as a “dead mall” after Target left, but it does seem to be doing decently well for itself. Some other tenants I remember from the mid-90’s were Famous Mart and the 50% Off Store. Across the street (in the picture of the sign) was a Lowe’s that transformed into a United House of Prayer for All People…I always thought that was funny. Do you remember Veras Pets ? I sold her reptiles from 1989 till 1994. At the earliest he can remember (which would have been sometime in the late 60’s-early 70’s), the anchors were Richway (on the front right corner), Kroger Sav-On (front left corner), Peebles (back corner, where it is now) and Sears (rear of the mall). The Richway, of course, became Target, which closed in the early 90’s. Kroger was bought by Bi-Lo, which existed for a few years before moving into a strip mall next door. Sears left, but he can’t recall when…I sure don’t remember it there. Peebles soldiers on. Also, the building across the street that I mentioned was originally Zayre, then Lowe’s, then the United House of Prayer for All People that I got such a kick out of. 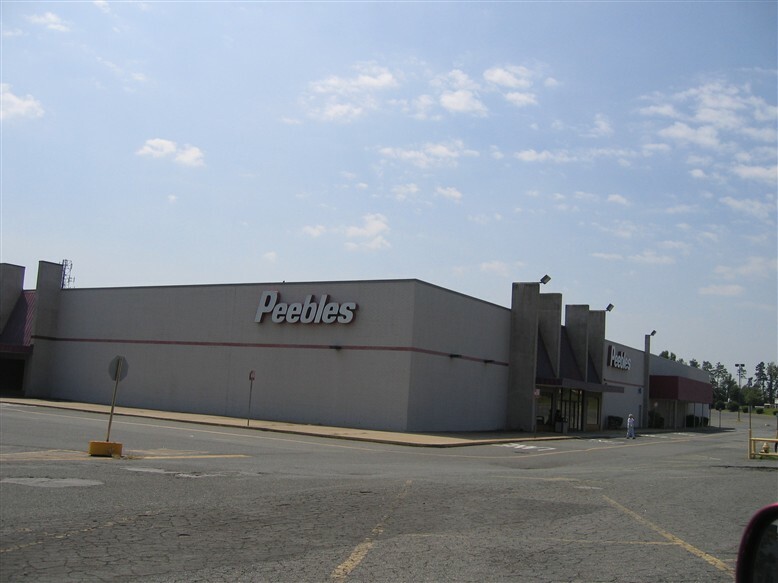 If my memory is still intact, the Peebles was originally a store called The Collins Company. I never knew much about them, except that they also had a store at Tryon Mall. Kroger Sav-on was never in the mall. The supermarket in Freedom Mall was a Harris Teeter (renamed Big M for a few years in the 1970s) and it closed in 1992. Kroger was always across the street; it opened about 1978. Kroger WAS in most of the other “Richway malls” in Charlotte, though. If I recall correctly, the Sears branch in Freedom Mall was a Sears Surplus Store, which was later called Sears Outlet, rather than a “regular” Sears. I believe Blair is right about Peebles having been a Collins store. I think all their Charlotte stores started as Collins. There was one at Cotswold too, I think. Charlotte-Mecklenburg government bought the mall for about $6 million some years ago after Target closed. I’m surprised the mall is still alive. Its exterior and parking lot seem much more run-down than the mall’s interior is. 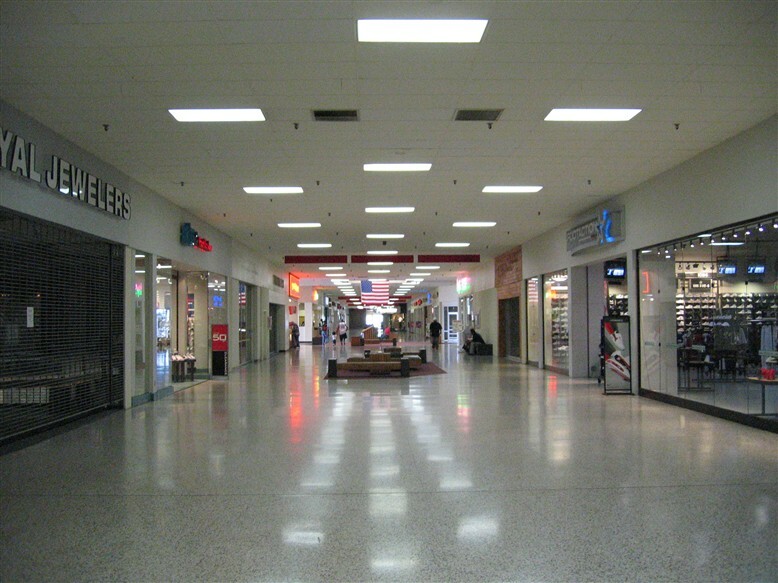 There are strip malls around the mall with stores such as K-Mart, Bi-Lo, etc. so there must be enough business in that part of town to support a derelict mall, though. For me, Freedom Mall will forever mean the once next-door Viking Twin drive-in theater (1969-81). A late-‘ 70s/early-’80s summer tradition for my family always consisted of a fast-food dinner at the Weiner King just down the street (and across from K-Mart), followed by an hour or so of knocking around the mall before heading over to the show. The twin ozoner is long, long gone, the land now occupied by some sort of technical school. Hints of the former theater entrance remain, however…if one knows where to look. About 50 yards or so down Freedom Drive sits the long-vacated Village indoor theater (twinned in 1981). Photos of the Viking Twin can be found on a certain drive-in tribute site, so fire up the ol’ search engine and enjoy reminiscing. I agree with Chris. Having been in Charlotte over the weekend, the exterior made me not really want to step into the place. i grew up near the mall and it once was a great place. After Target and Harris Teeter moved everything went downhill. there is a lot of construction going on now and i was wondering if anyone knew exsactly what was happening. I’m crossing my fingers for something wonderful. Why are all the interior signs red? These malls are really weird, it’s like an enclosed strip mall or something. I live down the street from Freedom Mall, and I’m there just about every other weekend. It’s pretty dead, when you go in theres less then 10 other shoppers in the whole store. That Fashion Trend/Cents store opened for a few months, shut down, renamed itself, and shut down again. The only stores that have been up and running and actually have business is Rainbow and the footlockers. I love the Freedom Mall !!! I hope it stays around for a long time. I travel to Winston Salem from Florida a few times a year and no trip is ever complete without a stop at this mall. It is kind of strange at first to be walking around a mall where there are only a few other people, but it is a really cool place. There is just something about it. Thanks for the history, I wondered about it. I am on my way there today, headed back to Florida. Freedom Mall was purchased by Mecklenburg County Government. The Mall will be converted to the Freedom Center housing Charlotte-Mecklenburg County Government Offices: Land permitting, DSS, Voting offices, Voting Machine Storage, Council on Aging, Ect. In total the county will have a couple of 1000 employees working in this center. The work being done on the old mall will be Green building practices, parking lot will be landscaped there will be public art and the face of the building is being completely redone adding windows all the way around the build it is a very Modern Sleek Design. The old mall is being brought back to life as another use. I WORK AT PEEBLES IN FREEDOM MALL AND WOULD JUST LIKE TO SAY IF YOU DISREGARD THE CONSTRUCTION IN THE PARKING LOT AND COME INSIDE PEEBLES CONSTANTLY HAS GREAT SALES AS WELL AS RAINBOW AND SIMPLY FASHION. THE MALL HAS A GREAT SWEETS STAND AND A FLOYDS, ( SOME OF THE TASTIEST AND CHEAPEST HOME COOKIN YO CAN GET ). AND OFCOURSE WE HAVE FOOTLOCKER, FOOTACTION AND KIDS FOOTLOCKER. THIS MALL IS A TRADEMARK TO PEOPLE IN THE AREA. EVERY DAY THE MALL IS FILLED WITH ALL TYPES OF PEOPLE, NOT TO MENTION THE OLDER PEOPLE THAT COME THERE JUST TO WALK SOMEWHERE WARM AND SAFE. FROM ALL OF US WHO STILL LOVE THE MALL WE THINK IT STINKS THAT THE COUNTY IS TAKING THE ONLY MALL ON THIS SIDE OF TOWN FROM US. KEEP IN MIND NOT EVERYONE LIKES HUGE MALLS FULL OF OVERPRICED STUFF. NOT TO MENTION, SOME OF US ACTUALLY LIKE OUR JOBS……… THANKS ALOT. Was just over in Charlotte a week ago, 11/3/07, and since I was in the area I stopped by the the Freedom Mall. Honestly I’ve never been in a mall so run down! It’s a shame that it hasn’t been taken care of and the parking lot was horrible too! But after reading some of the comments I can see that they might be shutting it down. So I can understand why it’s been getting worse. I have a very hard time believing the pictures above were from only two years ago! Over half the ceiling tiles were knocked out, over half the stores closed down, and seems like over half the parking lot unaccessible too! The area looked in need of a major renovation. I was hoping to find some good things in Charlotte, but on that side of town from the airport to virtually all around on the west side, it didn’t look good. Must be a very poor area. Definitely something needs to be done. It’d be nice to have one of the big cities in NC, Charlotte, in better shape! I’m over in the Raleigh area. Almost moved near Charlotte, glad I didn’t from the looks of the west side! Maybe I just was in the wrong part?! Some of my fondest childhood memories are of freedom mall and the baseball field that was behind it. West Chester use to have two baseball fields in behind freedom Mall. Lot of good games played there. Christmas time at the mall use to be a big deal for us. Freedom Mall was a sign of Westside Pride. Now I don’t know. I live in the Baltimore area now but the old Westside still brings back good memories. 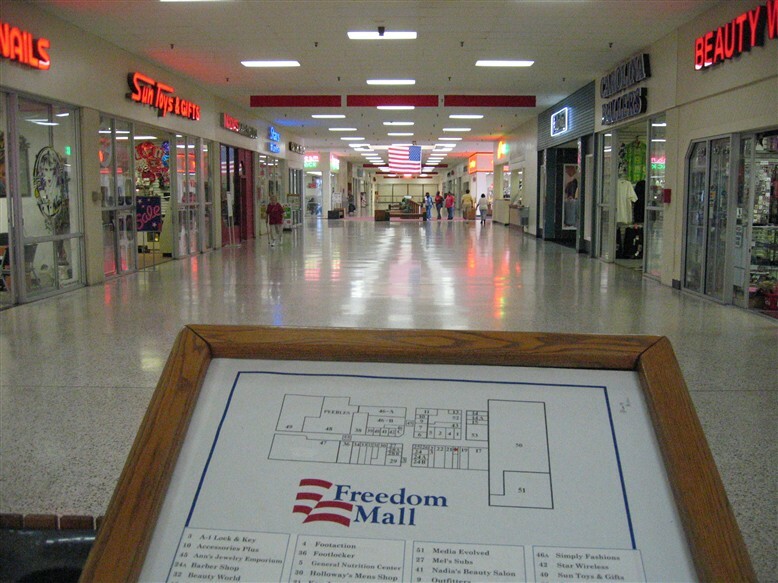 Freedom Mall will be officially closed in February 2008. As mentioned, Mecklenburg County purchased the dying mall and is transforming it into a county services center. The mall looks like hell because construction is underway. Tenants were allowed to remain open for Christmas 2007 but will now have to close. This area of town is in the resurgance mode. Look for new and improved retail in the corridor soon. Freedom Mall was a victim of its surroundings. Why Is Mecklenburg County buying a mall? Southerners are so silly. County government has no business running a mall. The county brought the mall so that they could consolidate several offices and establish more offices on the westside. This is an attempt to revitalize the Freedom Drive corridor, which has suffered from a decline due to the surronding neighborhoods declining average income and the residents getting older. This is a good thing and I hope that this is the start of something better for the Westside. I might be wrong but ive never heard of freedom mall. is this eastland mall? if it is eastland mall then don’t go there. there are plenty of better places to shop. eastland mall’s become the places were a lot of gangs hang out. its not a safe place. besides no one except the workers and gangs go there. half the place has been closed,but it did used to be nice. my mom used to be the manager at the movie theatre there. now it’s a parking deck. anyway the best malls are in the best places. Southpark mall is like one of my favorite places in the world! it’s the mall everyone goes to even though its a little expensive. Miley Cyrus even went there when she came for her concert. it’s really nice and has the best stores. the next best mall would have to be Northlake. it’s really nice to. they have different stores and it’s bigger, but if you can’t find something there it will probibly be at southpark. Carolina place is ok. i used to go there all the time when is was a kid cause we couldn’t afford the stuff at southpark. now it’s just overcrowded. someday it’ll probibly be like eastland. concord mills is ok to. its really big, but at least you don’t feel like your gonna be mugged there. they could do a better job of keeping it clean though. still it and northlake are the only ones with movie theatres. if you are visiting and want to go to a mall i say go to northlake or southpark. @Caitlin, Freedom and Eastland are not the same place. What a shame, with a name like Freedom Mall you’d want to find a Macy’s, or Dillards’ or even a JCPenney, I wish the new development luck! I live on the westside and I feel like we are the only side in charlotte that doesnt have a mall…this mall has been dead for a while Im suprise it lasted as long as it did..as stated by someone else after target and the others left it was all down hill… I am really frustrated at the fact doesnt seem like anyone cares that people who live on the westside have to travel out there way to go to the mall…The west is always represented as being a bad side of town when in reality ..do your homework, the northside is one of the worst sides in charlotte…but yet they have northlake…and the eastside has eastland mall…which thats not sayin much because eastland has seen better days also….but I would really like to kno what the city is plannin to do, because I hope they dont think they can take freedom mall from us and make up for it by given us a mall mart and a few low budget stores in a shopping center..
What’s the status of the mall now? Is it open for offices? Freedom Mall is still undergoing renovations by the County. As of now, a few agencies have moved in. The renovations have completed the first two phases and are now in phase three which most likely won’t be completed for at least 18 months. Her use of \”would OF\” as opposed to \”would\’ve\”, short for \”would HAVE\”, offends me more than anything else. Does anyone remember a movie theater inside the mall itself? Grew up on the westside. Help me settle a disagreement!!!!!! I grew up in this area, and yes when the mall opened there was a movie theater there for a few years, across from the Collins (Peeble’s). This website is wrong also, the mall opened in 1974, not 1964. @David, thanks for the reply. A coworker and I remember going there around 1976 to see a movie. Some of our coworkers said there were no theaters in there & said it was something we were smoking. We grew up and still work on the west side. We got our piano at Freedon mall – 1979 or so. I think the store was called Tadlock’s or something similar. I’m in favor of revitalizing this and doing something poitive for the west side, but I would point out that we now have two vacant courthouses Uptown as well as the Marshall and Walton buildings. How smart is it to move a bunch of city-county offices miles away from the government center; to remodel a department store into offices when the county already owns office buildings it’s mothballed? This mall looks like it got killed instead of being dead. It is plain and simple, but looked quite healthy in those 2005 photos. I think it is a shame and disgrace to kill off something that is working. There are few things that sit with me worse than jumping the gun on redevelopment. At least wait until it really is obvious it is failing. Was the Richway originally another store? This mall predates the creation of Richway by a couple years, and a friend of mine suspects it was originally Grant’s. @Bobby P., You are thinking of the Grants that was in the Freedom Village Shopping Center in the 60’s. I live down the street from Freedom Mall (now government offices; glad they did something with it)–have lived here for 15 years and watched the slow decline of the west side. I remember coming to shop at this mall as a child in the 1970’s when it was still a really good neighborhood. I like living over here and the convenience is great, but our property values have taken a nosedive in recent years–hopefully the city will successfully revitalize this area, and bring us some shopping, since Freedom Mall was pretty much it, and now it’s gone. No, there was never a Grants in this mall. There was, however, both a Grants and a Woolworths down the street in Freedom Village shopping center. The gentleman who said the mall opened in 74 was correct , it wasn’t 64. I grew up going to this mall as I’m from the west side as well, we would go there and get a orange julius lmao! Yes I remember the target but can’t think of what was there before, I remember the Sears and roebuck, the baskin robbins,the store you could get shirts airbrushed, the martial arts store lol, but most of all I remember the arcade, it was packed in the early 80s, we would stay there all night playing games, just a cool place to hang, havent seen inside since probably 87 88, from the looks of the pics looks pretty much the same. Does anyone remember the name of the place that sold chicken? It was across from the Sweet and Nutty spot. It was run by Asian’s but they had the BEST chicken!! Did they go out of business or relocated? I would love to find them again. It’s really a shame that this mall was bought by government and closed. 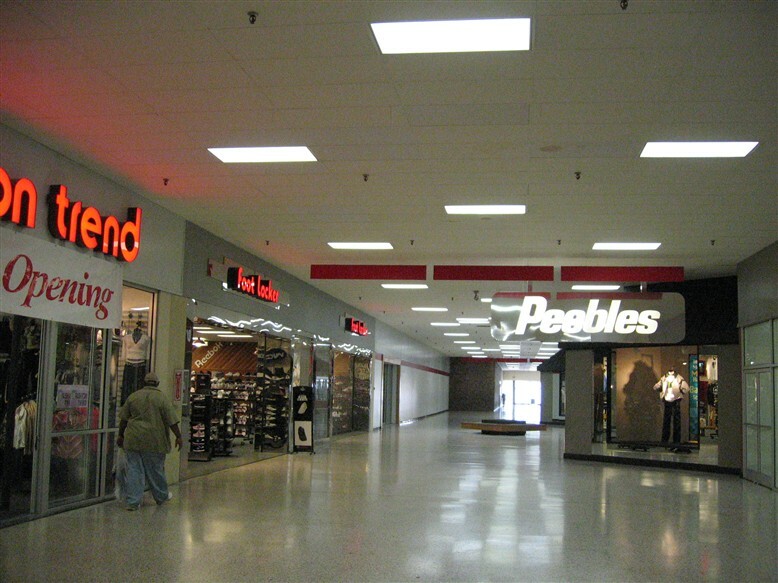 I went to the mall a few years before it shut down, and while it wasn’t a luxury mall, it had an anchor (Peebles, like a discount JCPenney) and a pretty full interior of stores. I’m sure that it met the needs of the surrounding community, and it would have been better to maybe add a grocery store again or other stores that would have served the local community and built government offices elsewhere. Basically, government killed a perfectly useful mall. Shame.